A mainstay of French popular culture, the Tour de France is a major sporting event which creates a real buzz among the inhabitants of the villages along its route. For its 2016 event, the tour will pass through the historic city of Angers during its third stage. The Château des Briottières, which dates back to the 18th century, is taking full advantage of this international competition passing through the region, to share this experience with cycling enthusiasts and those who are passionate about the magnificent French countryside. The sun, scenic driving routes and the best cyclists competing with one another to win the coveted yellow jersey are the essential ingredients for an unforgettable summer. Each year, the new itinerary announced by the organisers delights villages and regions along the competition route, and for the 2016 sporting season, the city of Angers will be included among the stage cities. The Château des Briottières is delighted to take part in this unique occasion to host the different participants of this international sporting event in a picturesque, lush and authentic setting, full of charm. The general public is also welcome to savour the timeless atmosphere of the château. Mid-way between Paris and the stunning beaches of Brittany and Normandy, the Chateau des Briottières is an essential stop-over during driving tours to discover France’s western region. 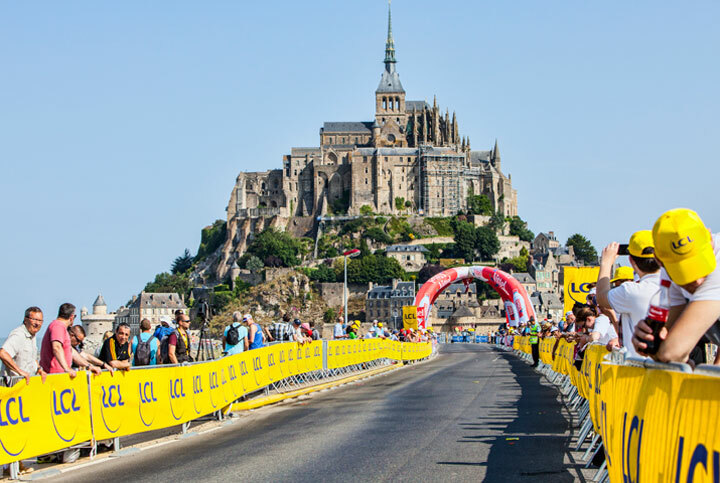 Seize the opportunity offered by the Tour de France 2016 which starts at the foot of Mont Saint-Michel, and set off on a journey to discover the beaches of Octeville and Utah where modern history was written. The Atlantic façade also opens up other coastal destinations, such as La Baule or the numerous Iles au Large, not forgetting Belle-Ile, L’Ile d’Yeu, L’Ile aux Moines, L’Ile de Ré or L’Ile Noirmoutier, where time seems to have stood still. You can also head in the direction of the Loire châteaux, the most beautiful of which are those at Chenonceau, Azay-le-Rideau, Amboise-Villandry and the Château d’Angers fortress with its world-renowned Tapestry of the Apocalypse. During your journey, the Château des Briottières offers you access to its 50 hectares of parks and gardens, as well as its spectacular living rooms. If the Tour de France 2016 is passing through Angers, it is in part because the film La Petite Reine, which is about a female cycling champion, was filmed in this area. There are numerous cycling routes available to visitors who come to the region. Inside the Briottières estate, visitors can cycle through the avenues which criss-cross the property. Bikes are provided free of charge to guests. You can then continue the journey by bike through the nearby town of Champigné; a cycling excursion can also be organised to visit the Château du Plessis Bourré situated just 13 km from the Château des Briottières. The historic city centre of Angers can also be visited by bike. In total, this region offers 350 km of cycling routes. On 4th July, which will mark the arrival of the competitors in the city, a large public fête will be held by the organisers and the locals. Share the post "The Tour de France stops off at the Château des Briottières"